Is the weather driving you nuts? For the umpteenth time this winter my daughter’s school was canceled and yet there was barely any snow on the ground. Awesome. So, we baked cookies, we painted, we watched Tinker Bell on Netflix. But it was time for a new project. And while I have stuffed challah with pastrami, pesto and cheese and even Halloween candy, sprinkles had simply been left out of my repertoire. 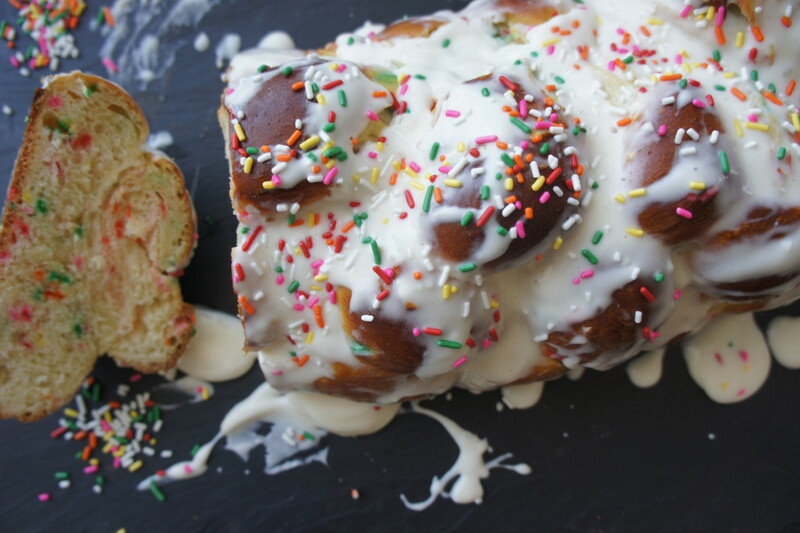 This funfetti challah is a great snow day or lazy Sunday activity, although a few warnings: it takes awhile to rise, so you will need to do other things in the meantime. And because it takes awhile to rise, it’s not a great recipe to make for Shabbat if you work on Fridays. 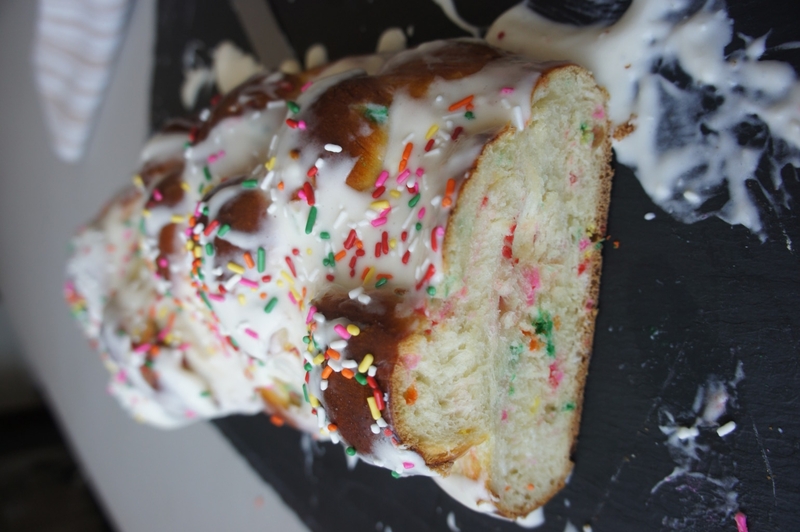 But, if you have the time this recipe is addictively delicious–it’s a hybrid between danish, birthday cake and challah. And as my mom would say, it doesn’t have any calories as long as you eat it standing up. In a large bowl or stand mixer fitted with the whisk attachment, mix together 1 ½ cups flour, salt and sugar. After the water-yeast mixture has become foamy, add to flour mixture along with oil and vanilla. Mix thoroughly. Knead remaining ½ cup flour and the sprinkles into dough, continuing to knead for around 5 minutes (or however long your hands will last). Place dough in a greased bowl and cover with damp towel. Allow to rise at least 3 hours, punching down once if possible. Preheat oven to 350 degrees. 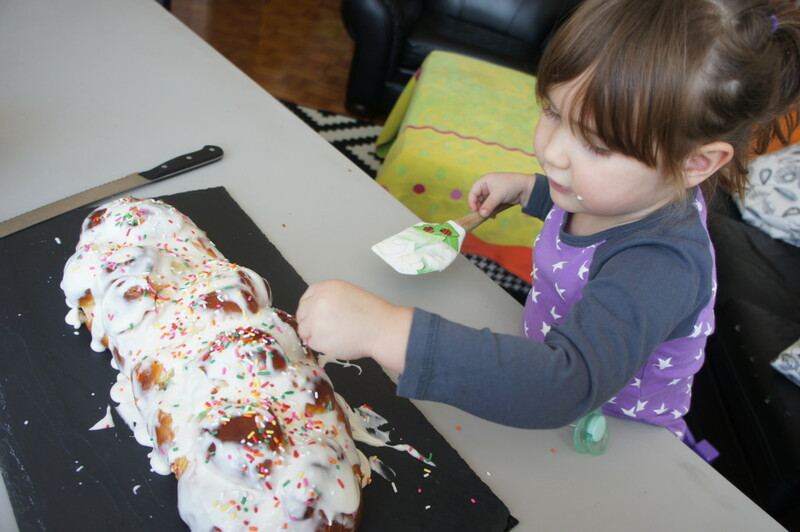 Braid challah into desired shape and place on a baking sheet with a silpat or parchment paper. Allow challah to rise another 45-60 minutes, or until you can see the size has grown and challah seems light. This step is very important to ensure a light and fluffy challah. In a small bowl beat 2 egg yolks with 1 tsp water. Brush egg wash liberally over challah. If making one large challah, bake around 28-29 minutes; if making two smaller challahs, bake 24-26 minutes. Allow the challah to cool around 10 minutes. To make the frosting, add cream cheese, butter, milk and vanilla to a stand mixer fitted with whisk attachment. Mix until smooth. With the mixer on low, add sugar, corn syrup, baking powder and salt and continue mixing until totally smooth. Using an offset spatula or large spoon, frost the challah while it is still slightly warm. Add additional sprinkles on top.